The Society of Motor Manufacturers and Traders’ Annual Dinner is one of the most exclusive events in the automotive calendar, attended by over 1,000 guests from industry, government and the media. Last year’s Dinner took place on Tuesday 27 November 2018 at the Grosvenor House Hotel, London, and was hosted by our President, Tony Walker CBE DL, MD, Toyota Motor Europe, London Office. SMMT Chief Executive, Mike Hawes, opened the evening with a warning about a ‘no deal’ Brexit being catastrophic for the British automotive industry. After two years as SMMT President, Tony Walker is stepping down. We would like to thank Tony for his expertise and guidance over the last two years. The 81st President of the SMMT will be Dr George Gillespie OBE, Executive Vice President, HORIBA Automotive Test Systems (ATS). Comedian, actress and writer Katherine Ryan, entertained the crowds at the end of the evening as the celebrity guest speaker. Well known for her appearances on Live at the Apollo, Katherine’s other TV credits include Mock the Week, Have I Got News For You, Never Mind the Buzzcocks, 8 out of 10 Cats, The Apprentice: You’re Fired and the Radio 4 institution The News Quiz. She’s been a regular on comic challenge show Taskmaster and music quiz Bring the Noise, and has also appeared in Channel 4’s comedy Campus, BBC2’s Episodes, and has hosted BBC Two reality contest Hair. BBC Radio 2 DJ provided the music entertainment for the evening. 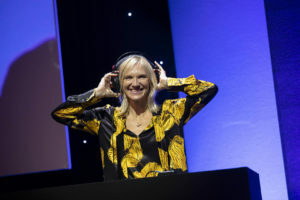 Jo joined Radio 1 in 1993, and in 1997 she landed her own daytime show, where she remained a part of Radio 1’s weekday line-up until 2009 when she began her weekend programme. Moving to Radio 2, Jo presented the evening show until her high-profile shift to co-host the drive-time show with Simon Mayo. As one of the nation’s favourite radio DJs, she has also presented coverage of the Glastonbury Festival on Radio 1, Channel 4 and BBC-TV, as well as having hosted several music programmes for Channel 4. MSXI (www.msxi.com) is a business process outsourcing company that provides technology-based services to enterprises in more than 80 countries. MSXI’s deep industry expertise combined with advanced data analytics and custom software solutions improve the performance of automotive dealership networks by increasing revenue, reducing cost, and enhancing customer satisfaction.